IAM Local 1403 members Mike Wells and Gerry Uffelman man the picket line at Precision Custom Parts in York, PA, where IAM members have been on strike since September 2, 2014. 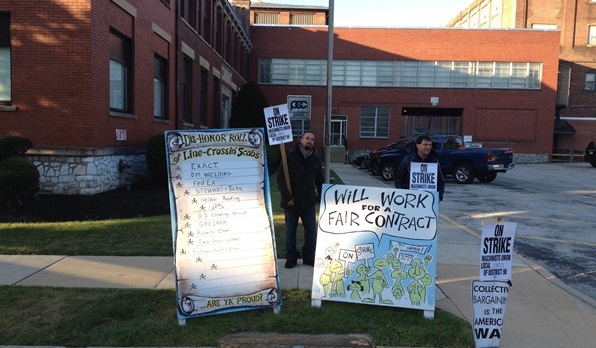 Entering their third week on the picket lines, more than 100 members of IAM Local 1403 are holding the line at York, PA-based Precision Custom Components (PCC). The members went on strike after failing to reach an agreement with the employer. Attempts by IAM representatives to extend the deadline and continue work on reaching a deal were ignored. PCC had proposed exorbitant increases to health care that would all but nullify any gains made in the agreement. PCC manufacturers custom fabricated pressure vessels, reactors, casks and heavy-walled components for nuclear and military applications.